The pulley therapy fixed metal frame system is modular, wide and flexible, to be fitted to the wall either horizontally or vertically, cantilevered or ceiling mounted. The pulley therapy self-supporting metal frame system is modular, wide and flexible to meet the professional’s requirements depending on available space and type of exercises to develop. Padded straps with black synthetic leather upholstery and 35 mm diameter chromed rings at the ends, ideal for pulley therapy. Different type handles for exercises and applications during pulley therapy. A number of additional tools to be used along with or in alternative to harnesses are proposed. The R.I.C. rehabilitation has been designed for the motor recovery and functional recuperation in spinal cord injury patients through an innovative motor rehabilitation method that is intensive, continued and personalized. ARCHIMEDES System is an open pulley therapy system that offers a wide range of exercises of various types, to meet the needs of the professional and the patients. More specifically, it is made up of modular structures that can be adapted to suit operating needs and the space available, a set of harnesses for different areas of the body, and other equipment that complete what is required. The system allows creativity in designing specific rehabilitation programmes. 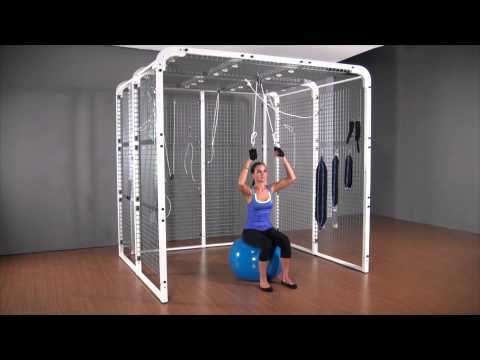 The pulley therapy metal frame system is modular, wide and flexible to meet the professional’s requirements depending on available space and type of exercises to develop. This means that options range from fixed wall or ceiling frames to free-standing frames with two or more support planes. In addition, each work station proposed in its standard configuration can be supplemented by various types of side grids or reinforcement details to increase the safe working load at any time, whether at the moment of purchase or later. Some icon symbols provide information on maximum or additional standard load for different metal frames. Other basic elements, intended as optionals or accessories, can create more configurations in addition to the proposed standard ones. Some examples are shown in the following pages. Straps and supports were designed in various sizes so they can be applied to different body regions to meet specific activity needs. These items meet the requirements of easy sanitation, durability and ease of use when setting up the exercises. A number of additional equipment to be used along with or in alternative to harnesses are proposed. 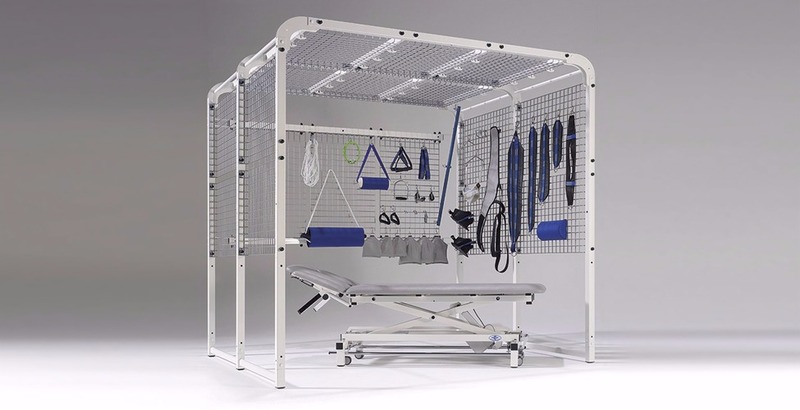 This equipment was conceived for various types of exercises and may also be used by professionals to create personalized workout programs to suit the patient’s specific needs. UniX series couches are suitable to be used either on their own or in combination with the frames illustrated further on. These couches can be height-adjusted electrically or hydraulically, but there is no segment displacement during adjustment. This means that they can be configured with or without transport castors, and a series of accessories is available. As an alternative, we can also recommend our couches from the Sinthesi range, which are suitable for manipulation and postural exercises. Due to its vast versatility, Pulley Therapy can be used for adolescents and the aged, for both preventive and therapeutic treatments. It makes it possible to make movements and assume postures, which keep the correct body balance in the person. It prevents damage due to asymmetrical activity by workers. In adolescents, it facilitates harmonious growth, protecting against disharmony as a result of sport, play or study activities. It favours the mobility and stability of joints after trauma, or in a degenerative pathology context. It improves muscle performance and movement of the fascias and therefore the lymphatic vascular flow. It makes it possible to assume re-balancing postures for the capsular ligament structures. It speeds up recovery of coordination and balance.